I think the reason why I mentioned using it around outside of my home is because I expect this person to come again. I know of a few people who would do this, but I just don't know which one. I will use the black pepper and salt on my porch. I wanted to hot foot someone who is very nasty to me. I have acces to their shoes. Do I have to sprinkle the hot foot in his shoes in a certain way? 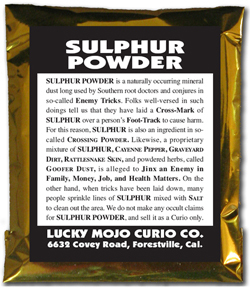 Also, I can't find pure sulfur but I did find 90% sulfur. Is it ok to use that? Hi everyone! I have hotfooted my enemy target (ex's current GF) a number of times. I have sprinkled powder on the carpet next to the side of the bed where she sleeps at his place, on his doormat for her to step on and cross over, inside a pair of fresh clean socks she had at his apartment, and even on her doll baby, on pictures and on candles that represent her. The problem is...she is NOT GOING AWAY!!!! Of course, other stuff might be happening to her that I just don't know about, but I really want her out of his life. Yes, I'm doing break up work and freezer spells too. Does anyone have any hotfoot suggestions for me so I can end this once and for all? I plan to put some powder down on the ground next to her driver's side door this weekend and maybe on her car handle too! So I did hot foot my target. I put the hot foot powder inside the shoes. I sprinkled a little inside but not a lot. I made the hot foot powder with ground red pepper, salt, and ground black pepper. How long does this usually take to work? I've already done 4 thieves vinegar like two months ago but have yet seen no results. I've also have been lighting a candle for the past month asking St. Expedite to remove this person far away from me. Is there anything else I should do? I'm thinking of starting the feces spell and just flush this person away. I have no idea how long it will take. That is up to Spirit. The feces spell sounds good. OK, here's some great ideas on how to use the hotfoot. I have ordered Hot Foot materials from LM in the past few weeks. After reading the thread about shipping I now understand that my order may take up to 6 six weeks. I even ordered the herb and candle books and cd as a separate order. So I'm not trying to get you guys to give away any trade secrets. I just didn't know my order would take that long but I'm not complaining. I can use everything I ordered either for my self or someone else. MY ISSUE IS...I am in a situation where I need this person out asap. I can't take the negativity. I now officially have high blood pressure. I'm at the end of my rope. Is there a basic hot foot recipe I can use? The internet is full of a bunch of bs and I really don't know who to believe, so I am here. Hi miss sophia, i dont know about a formula but i read a spell on here once about hotfooting (someone correct me if i am mistaken!) someone by placing their picture, (pictures with the eyes directly at the camera are best i think) in the heel of your right shoe. You write their full name on the back and your command ontop of it. Its simple and effective. Lucky mojo makes almost everything by hand with a small group of specialized staff.and it takes time but is worth it. In regards to asking for a recipe from them, im sure if you look through the herb and curio articles you can come up with one all your own .have faith, you have to believe you can do the work, this, intention and focus are imperative to attaining any goal in life. hope that helps! I think a Freezer Spell could help you out while you wait on your order. I did one today. But thanks. Thank you very much for your reply. I really appreciate it. May I ask how long should this be in my shoe? ,I am adding hotfoot powder to my order,I just have a couple of questions on how I can use it,if anyone could help me out please. I did read cats page on it,however I was wondering would it be possible to use it if I tweaked it a bit say could it make someone run to you,like hotfoot them mixed with another powder towards you? Do you think that could work. On a previous post it said you could use a doll baby,would you walk it backwards on powder,or fill it with powder? Hotfoot is not for drawing people to you, it's for sending them away. If you want to attract someone to you, then use Attraction or any of the love products like Come to Me. Mixing hotfoot with a drawing powder would not work for your intention. If you are making a doll baby to send someone away, put hotfoot powder inside where the feet are. If it's already been constructed, you can put the powder on the outside of the feet. If you have two people in a vinegar jar and you want one to return, I wouldn't add hotfoot powder. Focus on dissolving their relationship instead. You can separately put the unwanted person in their own vinegar jar, in which case hotfoot would be appropriate. For your colleague, I would suggest a freezer spell to stop her from interfering in the office. You can find lots of advice by doing a search here, as there are many freezer spell ideas to help you. Thank you I will look into this further and see how I get on but if I lay hotfoot powder do I need to cleanse or protect myself. For the situation with your step-daughter, I would invite you to read through the thread Spells for Friend Relative to Move Out Or Move Stay Away. For more information on the freezer spell, as recommended by Miss Athena, do check out the page Ice Box and Freezer Spells. Quick question. I went by my ex's apartment today to scope out the best way to collect dirt from his new girlfriend's foot prints. I knew it would be difficult because it's asphalt everywhere. I thought maybe shaking the welcome mat would be best but it's a rubber mat and didn't have any dirt that I could see. However I did notice there's lots of leaves and tree tassels all over the steps and walk way. I'm wondering if I can collet these and use them to hot foot the girlfriend? The only way I could get dirt from her steps would be to take a broom and sweep up the dirt but it would make it really apparent that someone swept their door steps. That's an interesting question. My guess is that if it has a trace of her footprint on it, you should be OK.
Good luck! Let us know how it works out, as I'm sure I'm not the only one here who is curious about this approach. Thanks Miss Athena that's what I was thinking. I havery read the hot foot page several times for planning this out and it made no mention regarding anything other than dirt. I'll give it a go and keep you posted. Can you add agrimony to a Hotfoot vigil. To send their evil back as you send them away. I would not, Basil. Agrimony and other uncrossing herbs could counteract the Hotfoot. Thank you deaconmillett for your guidance. I lit a black figural candle yesterday to hotfoot this woman out of my man's life. I dressed it with Destruction Oil, but also used HotFoot products on it because naturally it was to banish her out of his life. The candle burned well until it reached the bottom (her feet) where I really loaded the hotfoot products. Basically, the wick and her personal concern that I put inside a hole I carved in the bottom of the candle (a tiny piece from her menstrual pad) mixed with the hotfoot stuff in this puddle of wax and caused a pretty big puddle fire in my brownie pan where I was burning it. I tried lightly smothering it with another tin but as the fire continued, so did my concern that this could get out of control and probably wasn't going out on its own anytime soon, so I tossed sand on it. I always keep sand on hand just in case. It instantly went out...fire gone! My question is...should I only use hotfoot powder and oil DRY as a trick laid on her footpath versus an ingredient in my candle spells because of the sulfur in the hotfoot? Also, is my spell caput? It burned so well and I was really feeling excited about it as I have not been able to hotfoot successfully...but now I'm wondering since I had to extinguish it, was the hotfoot spell cancelled because it technically didn't finish burning? I was going to either toss the remains in a river to take her away from here/him...bury it under his bedroom window (I can't under his doorstep because he lives in an apartment and it's a concrete sidewalk) or under her window (same thing about the concrete by her door). Any thoughts? We all learn the hard way how to load candles so as to not cause an inferno. I know I've had my share! You shouldn't worry too much about this. The fact that it was her feet that went up in flames would suggest one helluva hot foot! Having said that, you did extinguish the work before it was complete. Just take the remains and either bury them in a graveyard or throw them into running water, the former to hold her down and away from your man, the latter to send her out of town. Then see what kind of movement you get from the spell. If nothing happens, simply repeat it but this time with less powder and oil. A little goes a long way. Thanks Miss Athena! What about the brownie pan/tin I was using? My "little" fire burned it pretty bad and left a nasty residue that I cannot scrub off...don't think I can use this pie pan again not to mention that it still has hotfoot stuff on it so it will just go back up into flames if I attempt anything on it in the future. How do I dispose of that? That would take one helluva hole! Thanks!!!!!! And use that pan again. make it her pan! 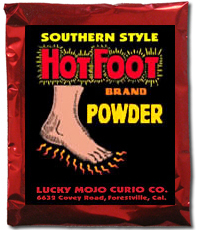 I want to use hot foot powder on a co worker and my boss. They are teaming up trying to fire me. I work hard, I almost got promoted but when that was going on they got together and they made it to the point where I didn't get the position. How can I use this? It's not an office, it's something else and we move around a lot. Please help. I want them to quit their job and go somewhere else. Welcome to the forum! When you get a chance (and assume you wish to), please introduce yourself in the Introductions thread. Here is an entire web page that miss cat wrote on how to use Hot Foot powder. Are you afraid of something happening to you because of doing Hot Foot work? That is generally not a concern unless they were to get wise to what you are doing and try to do something back. You can always do things to protect yourself while doing this as well. Look at Fiery Wall of Protection (http://www.luckymojo.com/fierywallofprotection.html). I recommend the spell kit if you are new to doing this kind of thing. For the Hot Foot, get the powders where they will step in them or dust papers and things that they will touch. That type of thing while simple can be very effective. I was wondering if anyone can help with hot footing someone that I do not know where they live. There is a woman that is pestering my husband and I do not know much of her . I do not have her name or anything. There may be a possibility that she was in our car at some point by the driver seat but I was previously sitting there before LO was born. Would it be good idea to do that anyone know? Do I toss it in the water afterwards? "Woman who is pestering my husband"
what you think about mixing hotfoot powder with dirt from a police precinct?, my building seemed to have acquired a drug dealer in one of the apartments.. But, I wouldn't mix them. Instead, I would use the dirt from the police precinct either by itself (with prayers to get him arrested) or mixed with something that is protection based. I'd lay the hotfoot alone. Jus my thoughts because I don't want to get an intention there of hotfooting the law. Other may agree with your thinking (as it is a great idea) but I fear taking any chances. You could try dissolving it in water, but the Hot Foot bath crystals would be better suited to that goal. Yes, state your intention: " _____ and ______ will continuously argue and fight"
Thank u so much Miss Aida I will get it ordered asap!!! I live in a marina on a sailboat several days per week. A new couple has moved in & I dislike their presence. I think Hot Foot might be the way to do it. It's hard to be sneaky in a marina, so many eyes watching at all hours of the day & night. This couple does not have a vehicle, they ride bikes. Would I put Hot Foot powder on the pedals of the bikes? Maybe the bike seat? I was also thinking to sneak up to their boat when I know they aren't home & sprinkle some powder on the deck by the "front door" of their boat. Does the powder have an obvious color to it? Would they be able to see the powder? I might sprinkle the powder on the dock near their boat, but I'm worried someone else may walk thru it. Is this a good enough plan or should I do more? I don't want ANYONE to know I'm doing this, but I REALLY want to run this couple away from my Marina as soon as possible. Thanks for your time! I forgot to also ask how many times should I put the Hot Foot powder out to drive this couple away from my Marina. Will one time suffice? Or should I do it once per week? Daily? Thanks again! Hot Foot powder is not exactly dirt-colored, so you will need only a small sprinkle to keep your work inconspicuous if you mix it with local dirt. You could also consider using the oil on metal or wooden surfaces. Remember always that it is contact with the feet you are seeking. This is not "hot hand" powder or "hot elbow" powder or "hot mental energies" powder. The pedals of a bike is a great spot for this. Be careful when sprinkling by their door as I said, it can be detectable if the ground you are laying tricks on is anything but dark. You can mix it with a little bit of dirt to mask the color, and they may think it's dirt that they had tracked in from somewhere else. How often you do this will depend on any signs or movement you get. You can start with a weekly deployment and see how it goes. Since my target and her husband are clean freaks, it's difficult for me to sprinkle the powder on the tiled floor (I brushed their couch generously with the powder but would really like to get her to walk over it too). If I mix the hot foot powder with brown eyeshadow and water and turn it into a paste that I can "paint" along the door thresholds would it still be effective? Thanks! It could be, as long as she steps in it. You could also use the oil and lightly dress the threshold with that. Be creative, the goal is to get her in contact with it by stepping in it. As far as when it will work, only Spirit knows. Hello, I have a question about hot foot powder! I purchased a bottle of hot foot powder but haven't received it yet! I have never used any spells or witch craft on anyone. Will this still work for me? Also, do I need to do a cleansing on myself before I use this powder? I really want someone to leave my home permanently. He is 18 years old, won't work and will not help around the house. He has caused me and my husband problems and I almost left my husband because of him. I really want him out and want to use this the right way for him to want to leave and stay away! Please help! Thank you!! Have you read through the posts in this thread? There is a lot of useful advice on using Hot Foot powder, so you are likely to find answers here. Your status as a newcomer to Hoodoo should not affect your ability to perform the work as long as your goal is justified and you put all of your sincere energy into the spell. We all had to start somewhere!